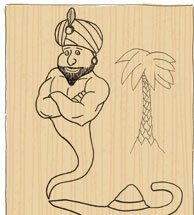 For this year's Christmas themed project, I had a look at what was in the pantomime cupboard and decided on Aladdin. 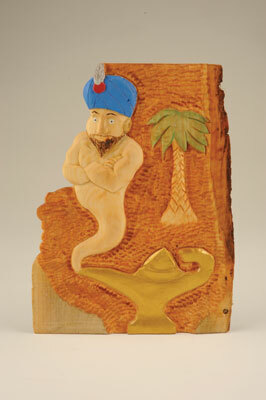 For those of you who want to do something in the round that is symmetrical, streamlined, and would look good on the mantelpiece, we have Aladdin's Lamp, but for the ones who want to stretch the imagination, have a bit of fun and add some colour to their carving, I think this relief Genie and the Lamp ticks all the boxes. I have chosen lime (Tilia spp) as it takes good detail, carves nicely and lends itself to this type of carving. 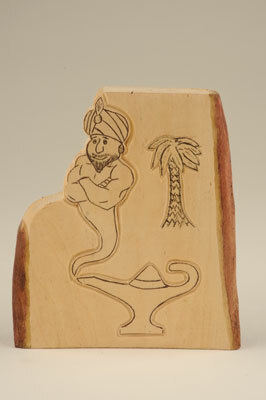 For the Genie, I am using a piece approx 280mm tall, 200mm wide and 25mm thick, with the grain running up the carving. 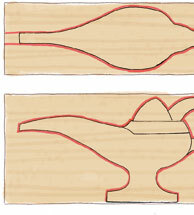 Transfer the design to your chosen piece of wood, scaled to fit (see photo 1). Mark out the outline - I used a V-tool but a knife cuts just as well - and start removing the background material (see photo 2). It was whilst doing this on the left-hand side of the carving that due to the curve of the piece on the rear, I made a hole, so I then decided to cut the outline away from the top half, which in retrospect, makes a nice feature, but this is optional. 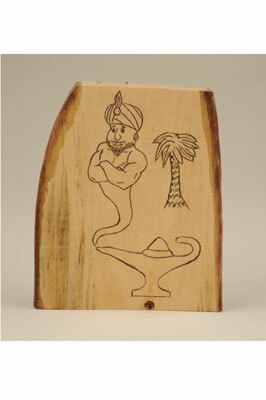 The palm tree is a link to before Aladdin's mother was Widow Twankey and she was Mrs Mustapha. 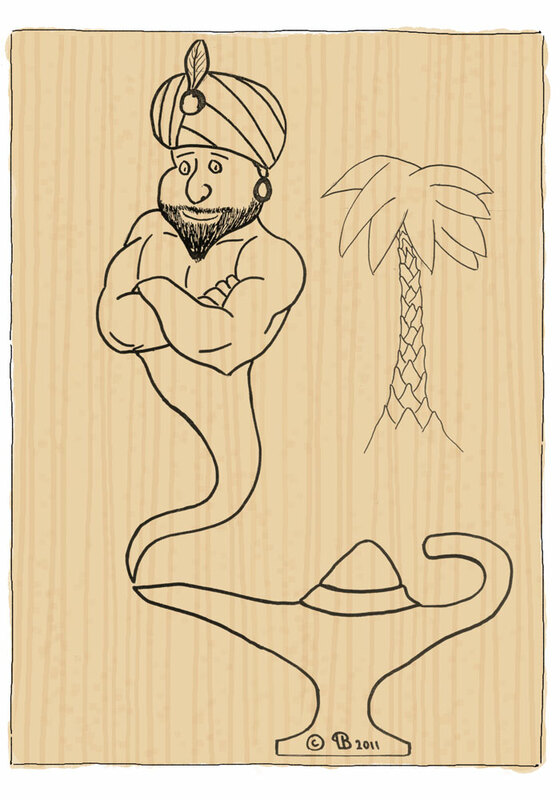 With most of the background removed with shallow gouges, I then set about carving the top half of the Genie using Flexcut palm tools and knives. 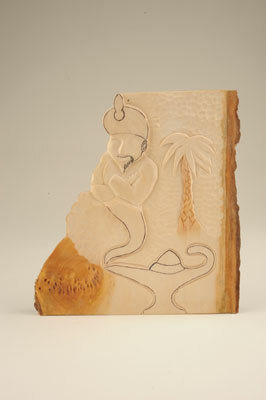 The palm tree is sculpted with a knife, and the leaves using a straight cut palm tool (see photo 3). 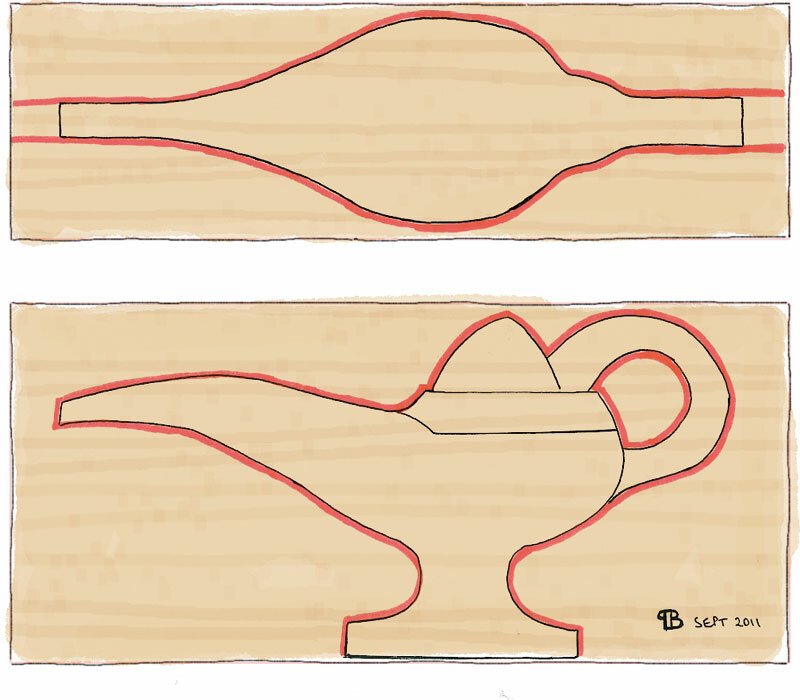 With the body of the Genie carved, move on to the lower part of the Genie and, of course, his lamp - this again was done with palm tools and shallow gouges. a horizon line just below the shoulder and behind the palm tree to suggest a sky, but the tooled effect of the background lent itself to a sandy, wispy scene. Of course, the choice of background is down to individual choice, as is the added colour, but I think the small amount of colour used adds a lot to the carving. The carving is finally finished with three coats of Danish oil. For the lamp, I tried out various bits of the wood and the final lamp you see here was from a slice of lime 190 x 100 x 60mm (7 1/2 x 4 x 2 3/8in), but this project actually scales down quite nicely to use up those bits of 4 x 2in that we all have lying around. First mark the profile from two sides, in this case, the side and top. Whilst it is still a block, drill a 25mm hole for the handle. First, remove the two cuts from the top profile. Tape or hot glue these back in place and you can then cut away the surplus for the side outlines - this leaves you with the cut out. With carving knives and/or palm chisels, rough out the dome top and handle. With the dome and handle looking right, it is then easier to shape the curved base of the lamp where it meets the footplate. Add the detail lining on the top of the body of the lamp (below the dome) and there you have your roughed out lamp. Next, it needs a bit of rubbing down to get it looking super smooth (or to summon the genie - Ed), work down through the grades to about 400 grit to give it a really fine finish, before giving it a couple of coats of gloss acrylic varnish, with a minute amount of metallic gold acrylic added. 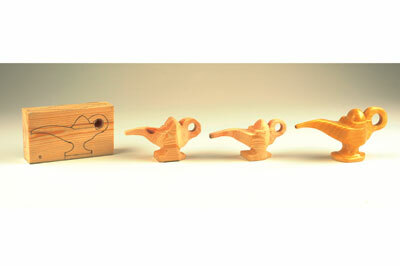 Paul Bignell teaches woodcarving at Bognor Community College on Wednesday evenings, 7-9pm.